Willie Wildlife Sculptures are delivered to the door in a pine crate. 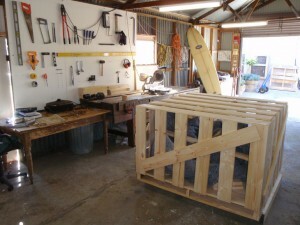 The six sides of the crates are all screwed together so all you require is a cordless drill to unpack the sculpture making it very straight-forward. It is not the duty of the delivery person to unpack or install the sculpture. We recommend employing the services of a local plumber/electrician or qualified tradesperson for any unpacking and installations. All of the Birdbaths arrive with 3 pre-drilled holes around the base as pictured. We recommend fixing or bolting the Birdbath designs down in case of pets or kids knocking or pulling on them. If the sculpture is for a private garden we recommend using the high grade stainless steel bolts provided and bolting the Birdbath onto a 600mm/24” * 600mm/24” concrete paver available from any hardware store. 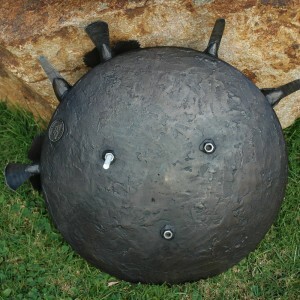 The three holes can be drilled with a small masonry drill bit first followed by a larger one. The birdbath can then be bolted down and the paver hidden under the dirt so you cannot see it. If the Birdbath is for a public garden or a frontyard we recommend fixing the bolts in by pouring a concrete base into the ground. All Birdbath Bowls have 3 stainless steel nuts welded to the base so it is possible to fix any of them onto stone or concrete them in. Please note that generally people choose not to fix Birdbath Bowls onto stone if it is for a private garden and just have them sitting there. However if the Birdbath Bowl is for a public place we always recommend fixing the sculpture to a base. We can supply 3 lengths of high grade stainless steel thread upon request. Depending on what sort of stone it is we suggest trying a masonry drill-bit first. If the stone is too hard you will need a Diamond Drill Bit and it may be easier to get someone out of the local phone book under Stone Drilling/Stone Mason to do this for you. Once the holes have been drilled we would recommend fixing the high grade stainless steel thread in with Chem-set/A100 or a similar concrete fixing type product. All of the Brolgas, Pelicans, Flamingos, Dogs, Hens and Ducks have had their feet drilled and tapped underneath so a piece of high grade stainless thread that we supply can be screwed in. This allows all of the Brolga and Flamingo designs to either slide into a piece of pipe in the ground which acts like a sleeve or they can be bolted onto a 600mm/24” * 600mm/24” concrete paver. 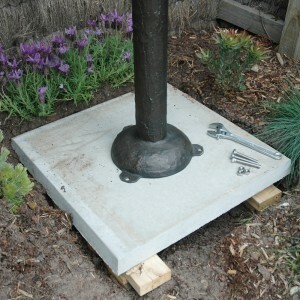 If the sculpture is for a public garden or a frontyard we recommend fixing the bolts in by pouring a concrete base into the ground or onto posts with chem-set. The Pear & Apple have one hole where a piece of 1/2″ stainless thread can be screwed in then fixed into concrete. All of the these designs have four points underneath where a piece of ½” stainless steel thread can be screwed in. 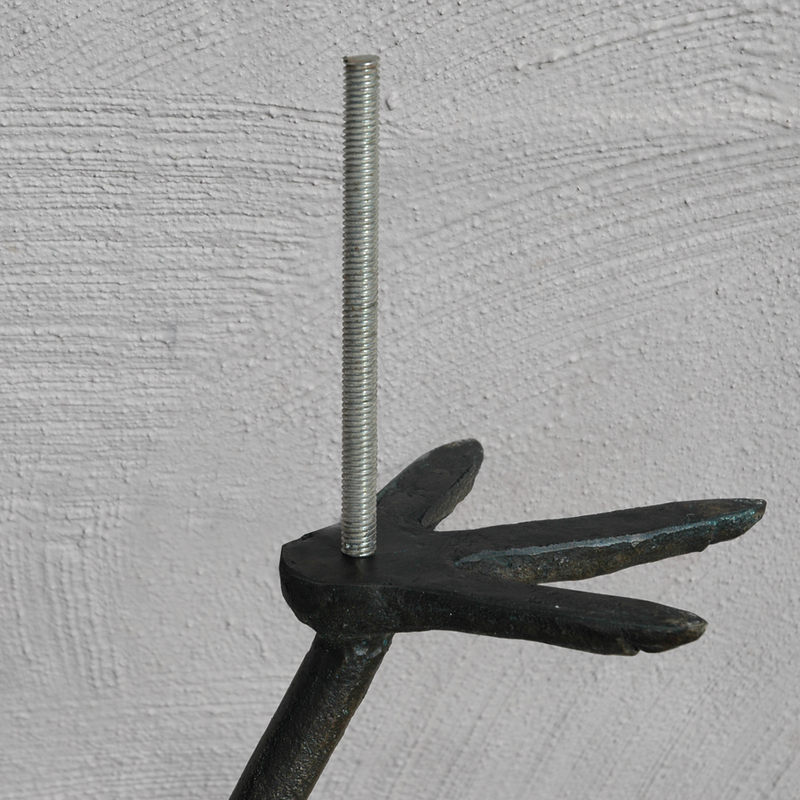 The 4 pieces of high grade stainless steel thread are supplied and we recommend digging holes underneath the sculpture and fixing the thread into concrete with chem-set. Whether the design is being installed into a private or public garden as they are very heavy. If you have any queries after reading these guidelines feel free to contact us. Please note that this is a guide only and there are many different installation options to suit different gardens. "It is a joy to discover such a unique approach to design taken by the artist."